Fig. 1. 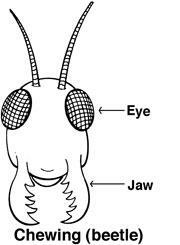 Diagram showing the jaw of a beetle. Insects that chew have jaws to bite; caterpillars (worms), earwigs and crickets. This spring we have received numerous calls and photos of insect damage on buds and emerging shoots. Feeding damage includes the following: a hole or a depression in an unopened bud; holes of various sizes inside the margins of a leaf blade; leaves that are misshapen size due to marginal feeding; young shoots that are missing a shoot tip or entire leaf blades. The damage described is caused by insects that have chewing mouthparts, that is, they have jaws (mandibles) (Fig. 1). This is a brief guide of some of the most common chewing insects found in early spring and the damage they cause. It does not include every possible culprit. If it does not fit your situation, give us a call. 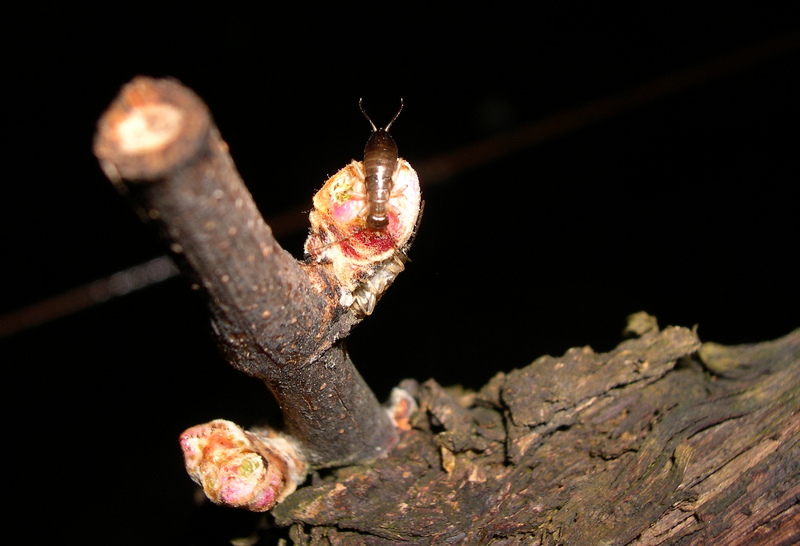 Earwigs may feed on swollen buds and young foliage in early spring. Damage is more noticeable and occasionally serious during damp, cold springs when shoot growth is delayed. Signs of feeding may be present on swollen buds (Fig. 2a and 2b). As shoots elongate, feeding occurs on the first leaves to emerge. Earwigs mainly feed at the edge of the leaf causing leaves to have ragged margins (Fig. 3). Damage is generally confined to the basal leaves. Damage may be seen on additional leaves if shoot growth is delayed due to low temperatures. Earwigs are nocturnal feeders and spend the day in dark, cool, moist places. In vineyards, they are often found under the loose bark of vines or inside protective cartons or tubes, especially during wet springs. Earwigs are usually not a problem unless populations are large. They are also predators and scavengers, feeding on eggs and older stages of other insects as well as detritus found on the vine. Vines generally outgrow the injury since the damage is usually confined to basal leaves. Arboreal camel crickets feeding on leaves cause numerous holes resulting in leaves that appear “lace-like” (Fig. 4). That characteristic is due to the thread-like remnants of leaf tissue in many of the holes (Fig. 5). Continuous feeding on a single leaf can result in a blade consisting only of tissue surrounding the main veins and numerous holes throughout any remaining tissue. We have observed this damage in hillside vineyards adjacent to oak woodlands and mixed species of white alders, madrone, California bay and Douglas fir. 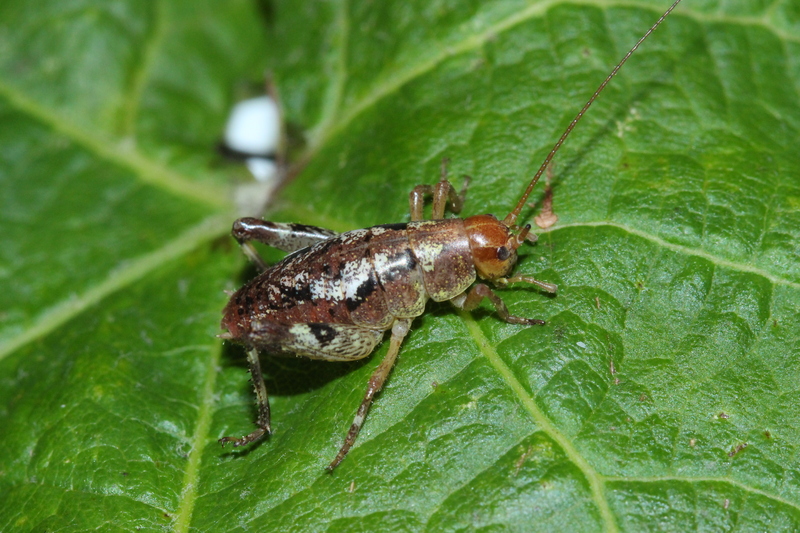 The adult cricket has been observed feeding and causing the damage. Adults do not have wings; they have powerful muscles on the rear legs making them strong jumpers. The body is somewhat humpbacked, brownish with variable black markings (Fig. 6a and 6b). This insect is only reported in the literature as occurring in the spring and in the North Coast in close association with oaks. The most commonly reported hosts are coast live oak, California buckeye and California bay. 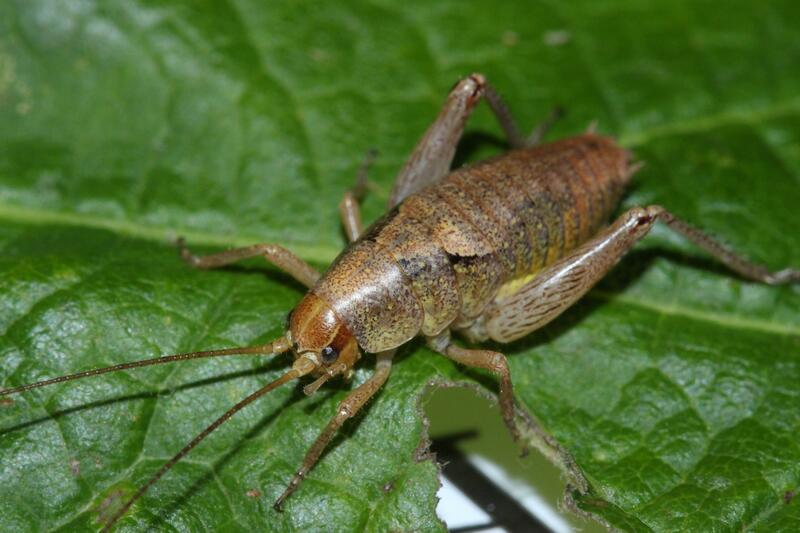 In the latter host, the crickets feed on the inflorescences. Immature insects hatch from eggs in February, become adults in early April and are absent by May. They have one generation a year. In vineyards they can be seen during the day feeding on the underside of basal leaves or resting at the base of the shoot or on the spurs. Their coloration blends with that of the spur or cane making them difficult to spot. When disturbed they readily jump to the ground. As with members of the cricket family they are active at night. Arboreal camel crickets are usually not a problem in the vineyard unless they move into adjacent vines early and feed on buds. 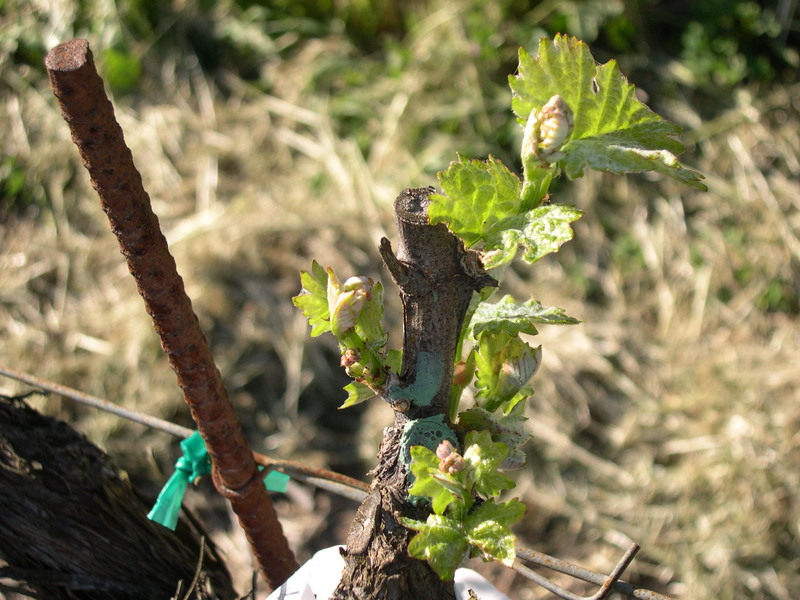 Vines generally outgrow early spring leaf injury. 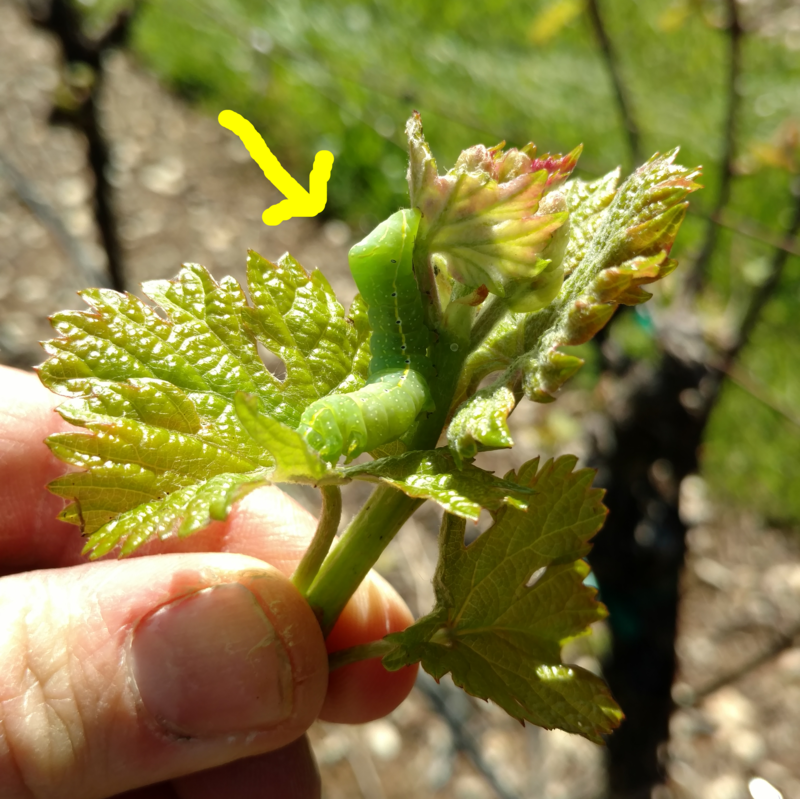 Cutworm damage to grapevines occurs from bud swell to when shoots are several inches long. Injured buds may fail to develop into shoots. 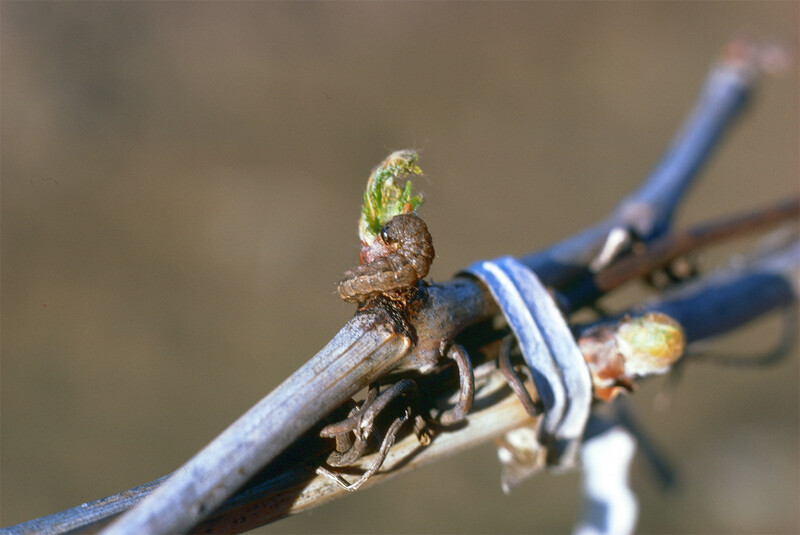 Depending on the cultivar, grapevines can compensate for early-season damage to some extent, as fruitful secondary buds may push. Yield reduction can be significant in some cultivars. The most common cutworm in the North Coast is the variegated cutworm, Peridroma saucia, (Fig. 7). In spring, cutworms leave the soil and climb up the vines. During the day they hide under loose bark often towards the base of the vine and come out to feed on new growth at night. They may also be found near the base of vines, hidden under soil clods, plant residue, or in clumps of weeds. 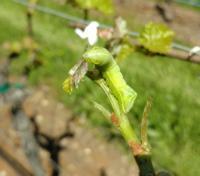 Grapevines first become susceptible to cutworm feeding at bud swell. Feeding may continue for about 10 days to 2 weeks during bud swell and rapid shoot growth. The number of damaged buds that can be tolerated depends on the cultivar. If less than 4% of the buds are damaged, treatment may not be needed. It is important to make certain that the observed damage is due to cutworms. It is best to see the insect feeding at night. The distribution of cutworms in the vineyard is not uniform therefore consider spot treatments. Cutworm feeding after shoots are about 6 inches long does not result in significant injury. 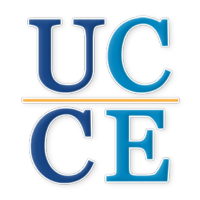 For treatment decision consult UC IPM Pest Management Guideline. 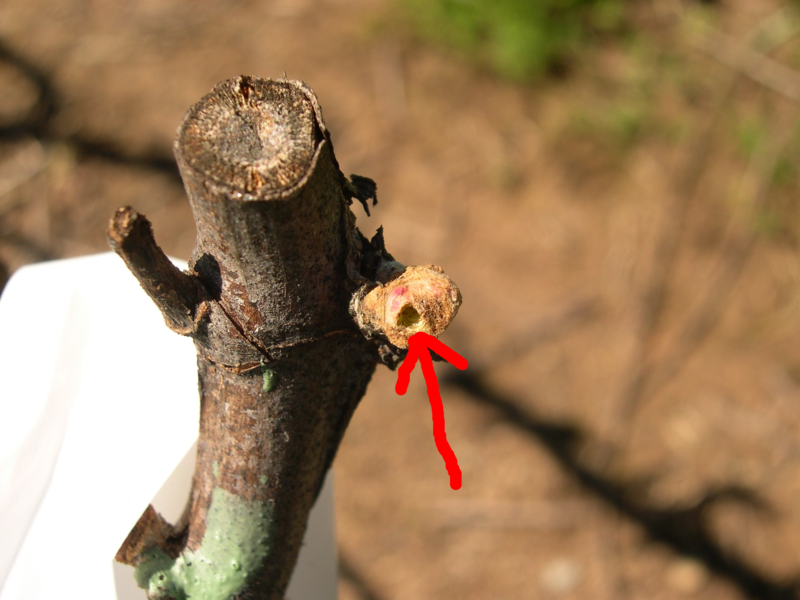 The damage caused by humped green fruitworm is very similar to that caused by cutworm – feeding on buds and emerging shoots (Fig. 8) – with the difference that they are seen feeding during the day. This fruitworm can be distinguished by the conspicuous hump on its rear and yellow stripes with black spiracles on the sides of the body (Fig. 9). Humped green fruitworm feeds on many woody plants as well as some fruit trees. Damage on grapevines is usually observed next to trees or woodlands. Some of the preferred hosts are maple, manzanita, oaks and hawthorn. It has one generation a year. It overwinters on trees as eggs, which hatch in early spring. The worms observed feeding on buds and developing shoots are older stages. Those will soon pupate, therefore the exposure to damage is a small window of time only early in the season. If treatment is needed, spot treat where fruitworms are present. The materials recommended are the same as for cutworms. Black grass bug is commonly seen on shoots and leaves in early spring thus we are asked if it is a pest of grapevines. 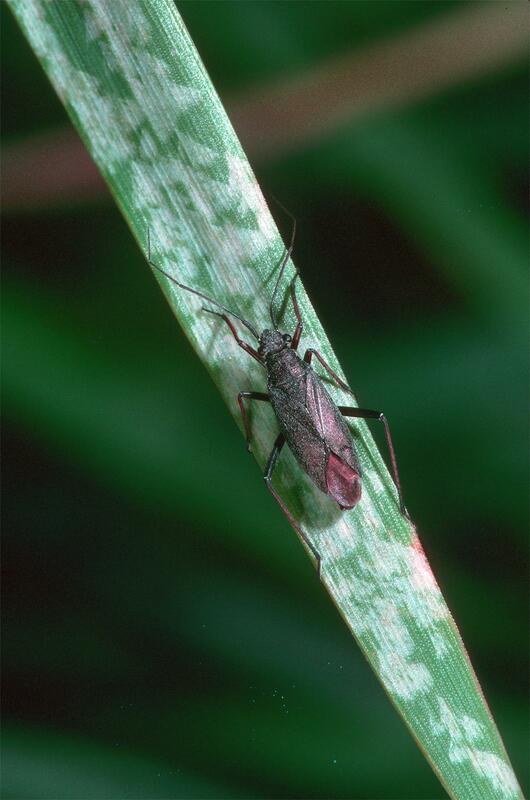 As the name implies this insect feeds on grasses where it can cause damage (Fig. 10). 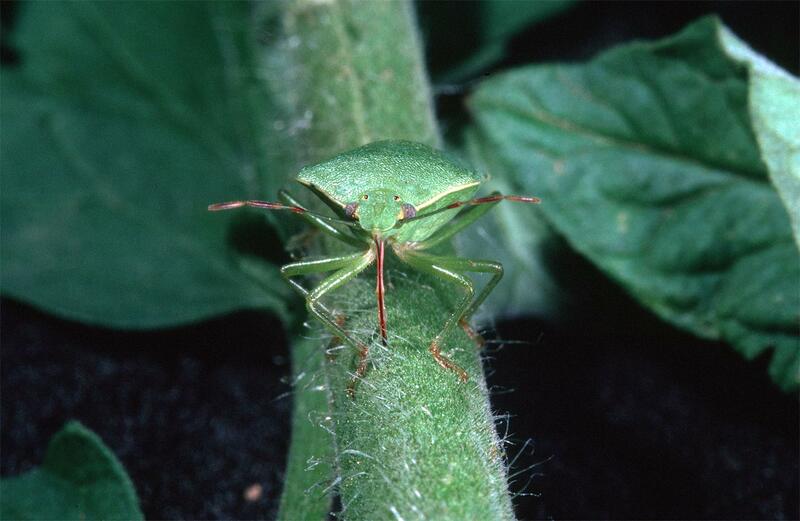 It can be a pest in small grain crops. It is probably abundant in vineyards due to tall grasses in or surrounding the vineyard before vegetation is mowed. 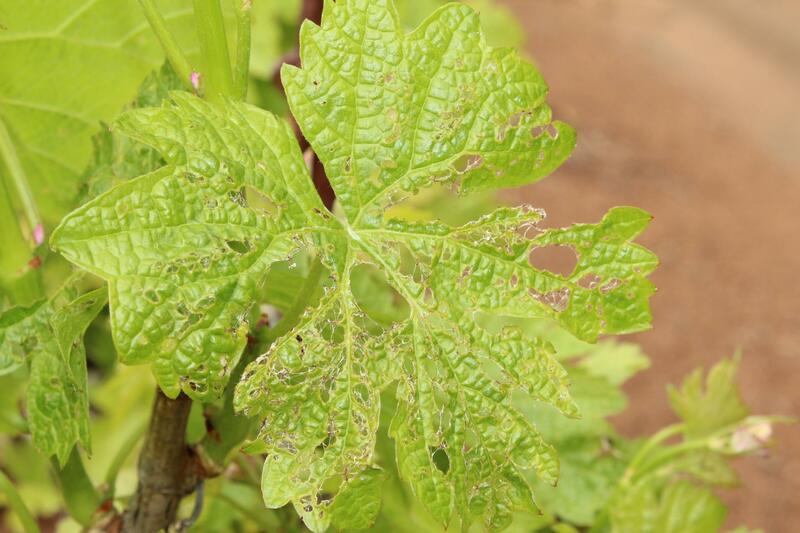 We have not observed damage to grapevines due to this insect. Fig. 11. 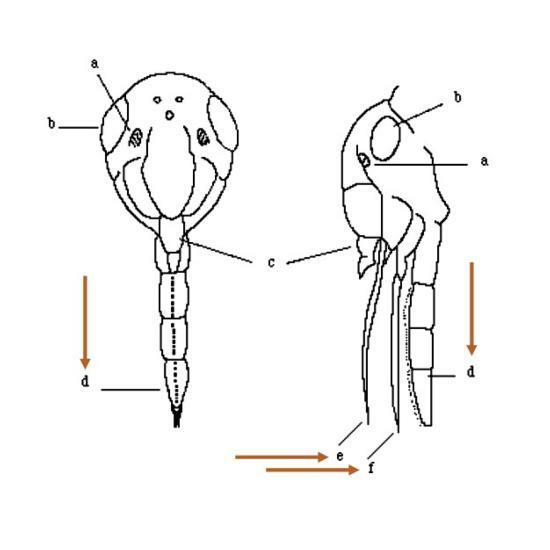 Beak of piercing-sucking insect composed of 2 stylets (e & f) introduced into host plant to feed, and sheath (d) that houses the stylets. Black grass bug has piercing-sucking mouthparts (Fig 11) and insects with these mouthparts cause stippling, i.e. very small yellow or white spots on the leaves. This type of damage is not seen in grape leaves early in the spring although black grass bugs are abundant in vineyards at this time. 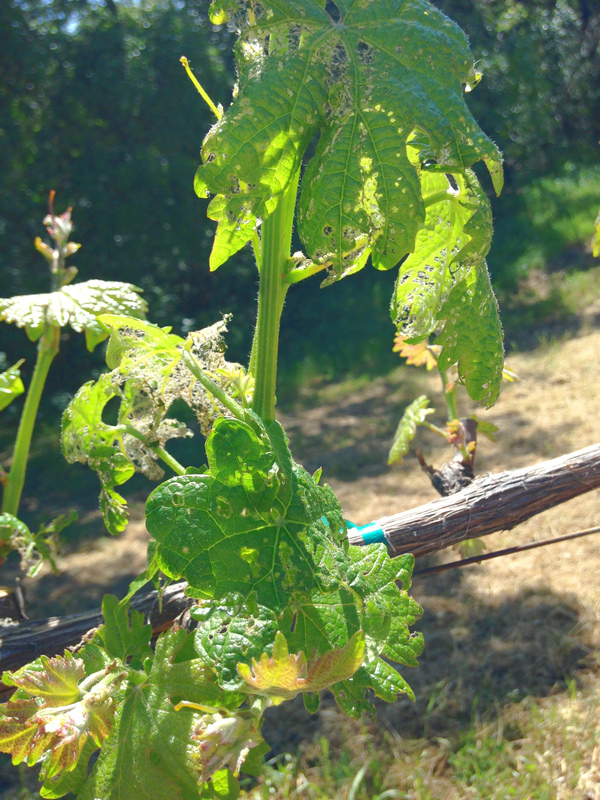 In vineyards, the most common group of insects with piercing-sucking mouthparts is the “true bugs” (Order Hemiptera): scale, mealybug, whitefly, leafhopper, sharpshooter, and stink bug (Fig 12).